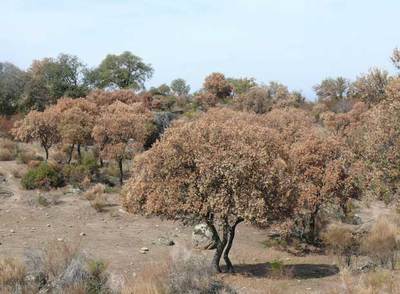 The holm oak and with it that unique ecosystem the dehesa are under threat. An invasive fungi phytophthora from Australia is ravaging across the dehesa causing a disease known as sudden oak death, aided by a deadly cohort of drought, several insects and other fungi. There are currently some 500 foci but scientists believe the worst is yet to come and that the production of Iberian ham could be seriously affected, not to mention the biodiversity based around this habitat. Regeneration and the more sustainable use of the system are seen as the only remedies.